Holy crafty jackpot! They all rock...but that Ariel skirt...you would be a serious hero in our house with that one, my friend! Where did you find the material? I love the bags and the doll clothes, too! 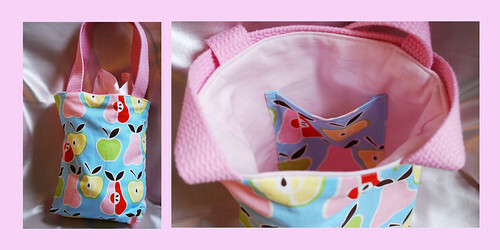 And the apple fabric - and the cute animal fabric in the last photo...soooo cute! I'm breaking my sewing machine out this week, for sure! You are so creative. I love that you used up materiel. I have a few projects going right now with using up materiel. Man, you've ben busy! Great gifts for the kiddos. I'm sure they loved them. Have fun on your trip! 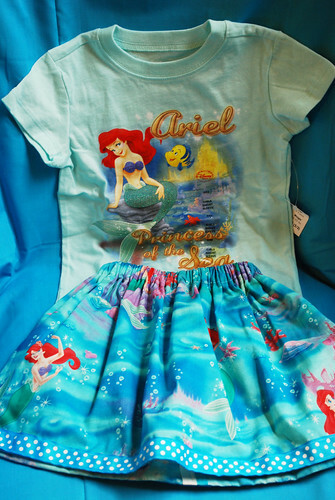 I can't wait to see the girls in their matching outfits, Breelyn awoke and ran to put on her Ariel skirt this morning, she says its the perfect outfit for the beach! And Callie is diggin her taggie blanket! Wow! You sure have been crafty! I love them all. Sooo cute. 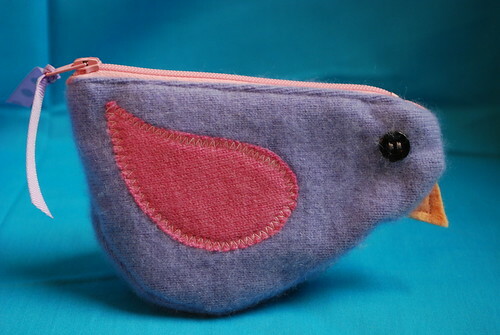 I especially like the birdie coin sized purse. Definitely inspiring. 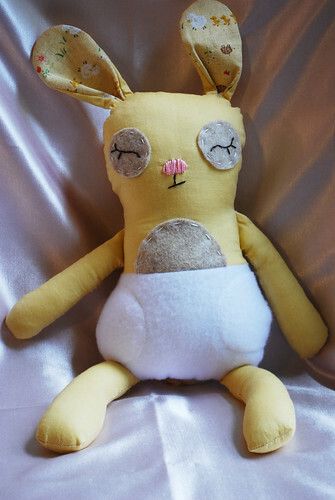 Ok....the little yellow bunny....SO! SO! CUTE! I adore it! You have been so busy, but what wonderful gifts. Jen! I think this is my first visit from Carrie's crafty tuesday and I am OVERWHELMED by your craftiness. I want to go away and weep for the lack of talent and craftiness in my life!!!!! What a brilliant aunt you are. 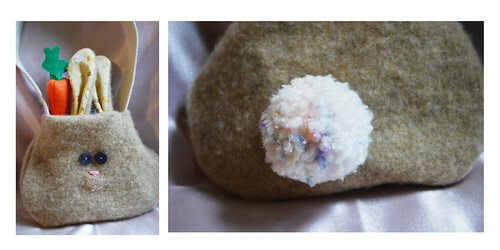 We have several handmade gifts from when my daughter was little and they are treasured to this day (she is nearly 14). I can't even pick a favourite, well, maybe the bunny..or no...the bird purse...or the dolls' clothes..NO the bunny bag...oh I give up. Brilliant work. P.S. Bunny. And brid purse. SO CUTE! Wow! Those are all so fantastic! Disney World!! Yay!! Have fun! I think Carrie nailed my sentiments exactly! Holy crafty Jackpot!! You're MY hero, girl! Oh my goodness have you ever been busy! What great projects. I bet your niece just loved her present (if she has it now! ), because I can't imagine that she wouldn't. Such cuteness! Love the little boy bag, too. That's a great idea for a boy. Love it all! Something to share?? Holy Cow!! That is amazing!!! All of it is so original and so cute!